After going through a mini bottle of Benefit's famous silver-pink highlighter High Beam, I was interested in trying a gold tone powder highlighter. I thought that a warm toned gold would complement my warm skin tone. Besides, I saw lots of swatches of similar gold toned highlighters (such as NARS Albatross and TheBalm Mary Loumaniser) and was curious to try it out. 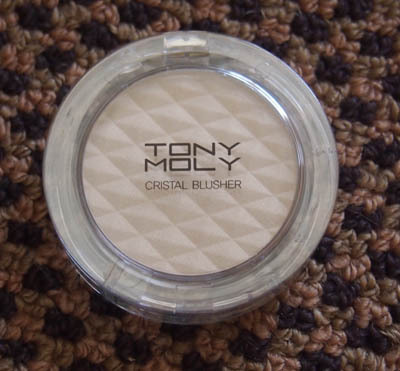 Previously I have reviewed another blusher from the Cristal Blusher line by Tony Moly and was happy with the product. 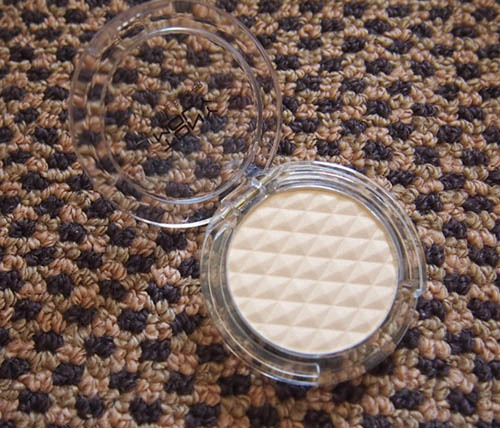 Like the Milky Violet blush, this highlighter has the diamond ridges in the new pan. The highlighter itself is not as finely milled nor as soft as the other highlighters I mentioned earlier, but for me, this is quite a good thing. This means that it is more difficult to load up on the highlighter on your face. 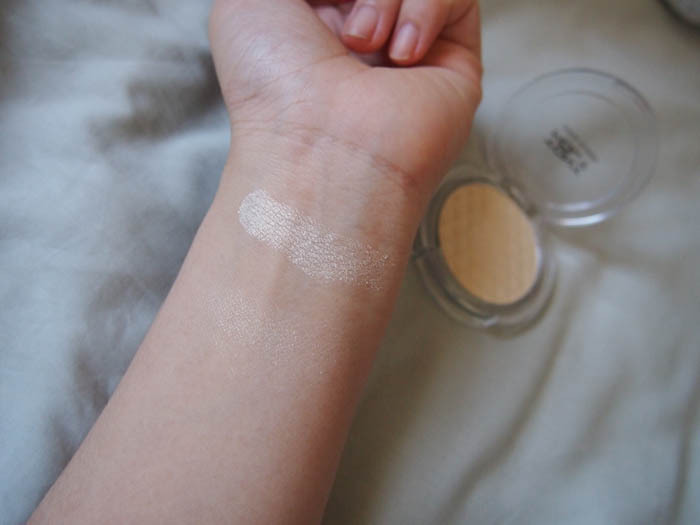 As you can see on the top swatch, you can be very heavy handed, but you don't need much blending in order to create a softer look. When blended out (as can be seen directly underneath the harsh swatch) the highlighter is a beautiful, subtle shade of gold. It looks beautiful on the high points of the face: cheekbones, forehead, bridge of nose, chin, and philtrum. I have been using my fingers for application and it still looks beautiful. I love everything about this highlighter as it does not sink into pores and gives a beautiful glow. 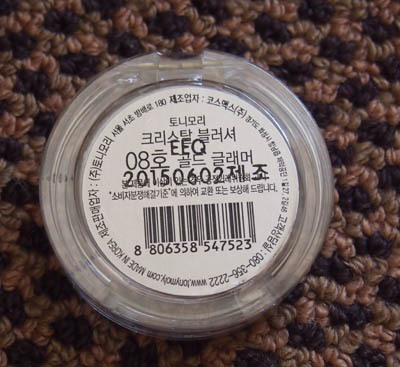 You can even use it as eyeshadow! The only drawback is that the gold sheen does not last the whole day and can disappear after a few hours. This however, is not particularly a huge concern for me. I would be happy to and am interested in picking up a few more colours from this line including the shading colours; #5 Sugar Brown, #7 Bronzing Brown, and some pink highlighting colours; #6 Pink Light and #16 Pink Bright. Would recommend!